ÆLFRIC (AELFRIC), there has always been a certain amount of confusion about the life of St. Ælfric. It is possible that St. Ælfric commenced his monastic life at Abington Abbey in his early years, and he is referred to as Ælfric of Abington by some sources. In addition, the Historia Ecclesie Abbendonensis (History of the Church of Abingdon), lists St. Ælfric as an abbot, however, he is not mentioned in the actual abbatial lists. It is known that St. Ælfric served as the first abbot (c. 969 — c. 995) of St. Albans following its rebuilding at the instigation of King Offa II of Mercia. Following St. Ælfric’s consecration as the third Bishop of Ramsbury circa 992, it appears that he retained the abbotship of St. Albans for several years before his brother Leofric succeeded him sometime after 995. When St. Ælfric was translated to the See of Canterbury as the twenty-ninth Archbishop in 995, he remained Bishop of Ramsbury until his repose. Whilst Archbishop, St. Ælfric commissioned the first Life of St. Dunstan, and was at least on one occasion ordered by King Æthelred to adjudicate a case between local nobles. St. Ælfric reposed on 16th November 1005, and shortly afterwards was popularly acclaimed a saint. St. Ælfric was initially buried at Abington Abbey. However, during the reign of Cnut (1016 — 35) his relics were translated to Canterbury. …the Anglo-Norman lord Philip de Braose, 2nd Lord of Bramber (c.1070 – c.1134) was hunting nearby and decided that the church was a suitable place for him and his dogs to spend the night. When he woke at sunrise, his dogs had gone mad and he was blind; his sight was only restored when he resolved to fight in the Crusades. There is some debate as to whether St.Afan was a bishop or not, the exact year of St. Afan’s repose is unknown, though according to Baring-Gould St. Afan flourished in the early part of the sixth century. thou teacher of piety, pastor, guide and inspirer of men's hearts. that He will grant great mercy to our souls. AFRICUS, (Seventh Century), the Confessor of Comminges in the foothills of the Pyrenees, little is known of St. Africus. He is often referred to as a bishop, although his name is absent from any of the lists of French bishops. ELPIDIUS, MARCELLUS, EUSTOCHIUS, and COMPANIONS, St. Elpidius a senator, who bravely confessed the faith before Julian the Apostate. As a result, in 362, he and others were dragged, tied to the tails of wild horses, before finally being burnt at the stake. EUCHERIUS, a married man who entered monastic life at Lérins in 422, while his wife, Galla, became a nun. They had two sons who also entered Lérins, and later both became bishops. In 434 St. Eucherius was consecrated Bishop of Lyons, in which See he served until his repose in 449. As bishop, he presided over the Council of Orange (441) with St. Hilary (5th May); and also wrote one of the greatly neglected spiritual works De Contemptu Mundi (On Contempt for the World). FIDENTIUS, (Second Century), though nothing certain is known of his life, it is possible St. Fidentius was the third Bishop of Padua. GOBRAIN, an early eighth century Bishop of Vannes in Brittany, who, at the age of eighty-seven resigned from his See and lived as a hermit until his repose in 725. OTHMAR (OTMAR, AUDEMAR), a native of the ancient Roman province of Rhaetia who, in 720, was appointed Abbot of St. Gall. During the time of he was Abbot, St. Gall grew in wealth and importance. Unfortunately, this gave rise to designs on some of the Abbey’s property by two local nobles who captured and held St. Othmar prisoner, initially at the castle of Bodmann, then on the island of Werd in the Rhine, where, after six months, he reposed (759). 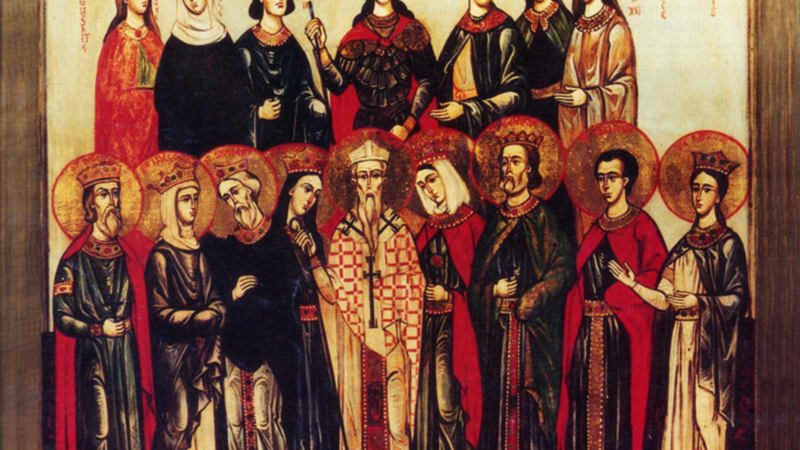 RUFINUS, MARK, VALERIUS, and COMPANIONS, (Date Unknown), according to tradition they were martyred in North Africa during one of the Roman persecutions, though nothing certain is known of their lives.